Black Cherry Live Stakes would make a nice addition to any front or backyard. The tree can grow in a variety of soil types and bloom in April and May. Before planting the tree make sure the tree is in an area that accommodates its size in the future. In addition to a roomy area, the tree also grows best in an area with thick soil that is suitable for drainage. 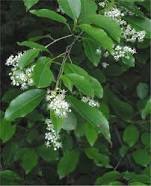 The Black Cherry tree begins to produce seed at ten years of age and will increase at age 30. Using live Black Cherry stake propagation is becoming more used as a wind barrier or shade. This type of stake is a quick rooting tree stem that will grow with the hedge or whatever is being grown an supported by the stake. Using the live stake provides a stronger root base for the hedge. Black Cherry stems are one of the several deciduous branches that grow quickly and provide a strong stake support for the growth of the hedge. Pricing is variable and depends on seasonal collection of the stems. Proper root hormone usage and following directions on planting the stem after harvesting is of utmost importance for a good, quick root start and a strong root spread. The reason this type of propagation is taking hold for the grower is because it is efficient, price effective and an excellent natural way to stake. Prices are reasonable but make sure the company you are buying from is harvesting properly to ensure healthy, quick, and productive growth. Some types of other deciduous tree stems that are being used are: Scouler's Willow, Austree Willow, Balsam Poplar, Black Mulberry and Blue Elderberry. These types of live wood stems have great potential to root themselves without a root hormone. Still providing a good root base to provide sturdy ground support. Black Cherry Tree produces a sour cherry, that is used is used in many recipes and eaten by birds.